Reviewing Shenandoah made me realize something: wow, there are a lot of sad sack leaders in Civil War fiction. In that film, it was George Kennedy’s Colonel Fairchild. He only gets one scene but spends all of it in a seemingly deep state of depression. His tone is muted, his eyes are downcast, and his whole demeanor suggests he’s lost faith in the Union cause. I likened Fairchild to Aldo Giuffre’s character in The Good, The Bad, and the Ugly. Billed bluntly as “Alcoholic Union Captain,” his scene is very late in the film, when Blondie (Clint Eastwood) and Tuco (Eli Wallach) stumble on a stand-off between Union and Confederate forces over a bridge. We only really see the Union side, which is a maze of fortifications overseen by the Captain. He presents the whole effort as a cynical enterprise, with the Union trying to capture the bridge twice a day but casualties are the only result. Blondie and Tuco need to reach the other side, so they pretend to enlist. The Captain takes this as an opportunity to tell them why that’s a bad idea and the pointless horrors they’ll face under his command. He admires their ability to drink because booze is “the most potent weapon in war. . . . Whoever has the most liquor to get the soldiers drunk and send them to be slaughtered, he’s the winner.” He hates the bridge. It can’t be destroyed because of its strategic value but its continued existence forces him to keep condemning his men to their deaths. Blondie and Tuco resolve the situation by blowing up the bridge, and the camera cuts to a close-up of the Captain, smiling satisfactorily as he dies from wounds received during the previous attack. The “Alcoholic Union Captain” sardonically surveys the battlefield, with the bridge in the background. The echoes here of Ulysses S. Grant and Vicksburg or Petersburg are clear. We have an alcoholic leader engaged in a siege over a key piece of ground, slaughtering his own men in a lengthy process to capture it. This is the Lost Cause image of “Grant the butcher” with one key difference: Grant was often depicted as relishing this slaughter or being nonchalant about it. Our Captain feels remorse over it, so much that it’s the root of his alcoholism, not a symptom. This isn’t the Grant in Spielberg’s Lincoln, which is much higher on the Union cause. We first see him (Jared Harris) as confident and efficient when he intercepts the Confederate peace commissioners, but during his final scene, as he watches the Army of the Potomac march to Appomattox with Abraham Lincoln (Daniel Day-Lewis), he’s more subdued. Grant’s not as downcast as his compatriots in Shenandoah and The Good, the Bad, and the Ugly, but he nevertheless appears weary and sad, as does Lincoln. They know the end of the war is near, but neither seems very celebratory. This is not the drunken butcher of the old Lost Cause. Grant has been subsumed by a different Civil War trope: the sad commander. I couldn’t find a good shot of Grant from this scene, but here’s Lewis’s Lincoln looking melancholy. Lest we label this as only a Union phenomenon, Confederate pop culture commanders are some of the saddest sacks of all. Indeed, Gettysburg (and its inspiration, Michael Shaara’s The Killer Angels) is a veritable pity party of Confederate generals. The charismatic, vibrant, and active Robert E. Lee who dominates so much Civil War literature is almost completely absent from the story. This Lee (Martin Sheen) repeatedly reminds us his primary trait is exhaustion (he’s “so very tired”). Longstreet (Tom Berenger) is equally despondent and, like Lee, only grows more so as the film progresses. Longstreet shows flashes of having been a much more jovial fellow, but the recent death of his children and the weight of command have sapped him of any high spirits. Lew Armistead (Richard Jordan) spends the entire battle on the verge of tears—distraught over the prospect of fighting his best friend, Union General Winfield Scott Hancock (Brian Mallon). 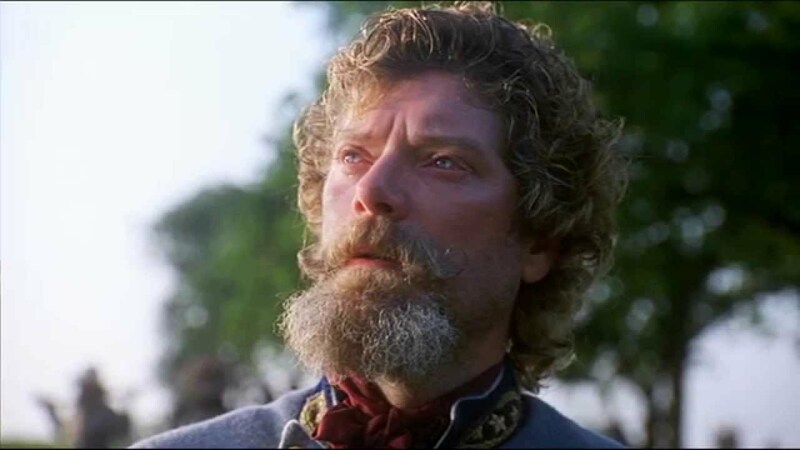 George Pickett (Stephen Lang) is the foil to these gloomy gusses, as he preens around camp, boasts of his beloved “Sally,” and yearns for battle, but this is just to make his inevitable fall all the more poignant. After his disastrous July 3 assault, Pickett’s joie de vivre vanishes and he becomes a spiteful, weeping mess. Our two main Union commanders, Joshua Lawrence Chamberlain (Jeff Daniels) and Hancock, are a little more upbeat and motivated, but both have a similar sadness lurking under the surface. In Shaara’s story, as in much Civil War fiction, melancholy is the primary qualification for leadership. So, what to make of all this? First, let me be clear that I don’t object to soldiers or commanders (fictional or otherwise) feeling sadness or remorse over their horrible circumstances. Anyone familiar with this blog knows one of my pet peeves about war fiction is its tendency to portray battles as mere sporting contests with little regard for the actual human cost involved (what I call the “Football Analyst School”). Second, I am aware that the “reluctant general” is a literary trope that goes back at least 3,200 years to King Priam in the Iliad, but Civil War fiction seems particularly enamored of this trope and that’s worth some consideration. I don’t have a perfect answer, but I do have a couple of theories. First, it’s always worth remembering that the Civil War was, in fact, a civil war. Wars are abundantly tragic on their own, but ones in which a nation fights itself are especially so. This aspect is even more prominent in Civil War historical fiction because it occurred in the United States, one of the most influential sources of popular culture, and during the 19th Century, when combatants were eager to record their experiences. The Civil War was tragic, so its fiction is too. Indeed, Ashley Wilkes, may be ground zero for this trend, being a major character in the Civil War’s most famous piece of popular culture. He serves the Confederacy honorably but does so with a constant sense of ideological and emotional detachment, ultimately rendering him a weary and melancholy symbol of the defeated southern gentry. This is, of course, a problematic depiction of the slaveholding class before, during, and after the war, but it brings me to my next theory: the influence of the Lost Cause. In order to render the Confederacy more sympathetic to future generations, reconciliationists and purveyors of the Lost Cause transformed the war into a “family squabble” with little regard for its actual causes. Once you remove any political or social causation, especially the unquestionably noble cause of ending slavery, then the war can only be tragic, bloody, and unnecessary. This is the image of the Civil War the revisionists endorsed and one Hollywood happily adopted when it took a more ambivalent stance on war in the 1960s. Once war itself became the enemy, characters had to be opposed to it. Otherwise, they’d be bloodthirsty sociopaths—essentially the Lost Cause’s portrayal of Grant and William Tecumseh Sherman. Pop culture, at least recently, has tried to present us with more nuanced depictions of Civil War commanders, but it’s still mired enough in the Lost Cause that, instead of making these men actually devoted to one cause or the other, it just makes them all cynical and war-weary. We can say all wars are ultimately unnecessary, but a war without a cause is indefensible, and any character deserving of respect would be a reluctant participant at best. Hence, the sad sack commander. I’m thinking there’s a little American exceptionalism in there also. In most war movies, foreign commanders and their soldiers are seen to be driven by duty to king or country. The British Redcoats, or German Wiermacht, fight without question or conscience. Only American leaders (especially those fighting other Americans) are introspective and remorseful of thier actions and/or cause. Love it too, and the way the war keeps disrupting the narrative in that film. It’s like another character. You’re close enough. No worries. It’s not so much that these guys should be cheerful, they just probably weren’t actually so relentlessly mopey. To stick with Lee, we know he had a certain fire and confidence in battle, and at times even relished his role as commander. There’s none of that in Gettysburg. The Lee of the quote you give is the only one in that story, and a constant gloomy gus does not make a very effective (or believable) commander. Your man Ellsworth was pretty chipper, wasn’t he? speech 1880 from which we derive the phrase “War is hell” (checked some sort of source anyway. ).